Perhaps one of the biggest draws of Sri Lanka for me was the wildlife. Aside from monkeys with the aggression of hungry lions, I generally didn’t associate Asia with wildlife, and had never been on an Asian safari before Sri Lanka. But my safari in Udawalawe turned out to be one of the best I’ve experienced, and was definitely a highlight of my trip to Sri Lanka. Here are some things to know to help you plan for your Udawalawe safari. 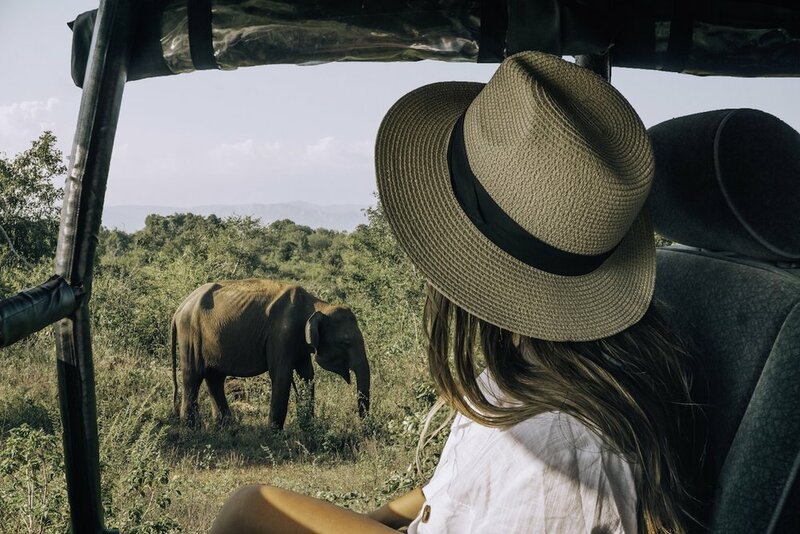 Chances are that a wildlife safari is on the top of your Sri Lanka bucket list, and for good reason. This small Asian island is home to some of the most beautiful, exotic creatures on the planet, from leopards to elephants to the sloth bears. After researching the various safari parks in Sri Lanka, I decided I wanted to visit Udawalawe, a park covering almost 120 square miles (30,800 hectares) of land. Udawalawe has the most elephants, is typically less crowded than Yala, and is conveniently located only 2 hours from Ella in south central Sri Lanka. I definitely recommend taking a safari here, and enjoying all the things to do in Udawalawe even after your safari is over! 1) Come for the elephants. There are tons of safari parks in Sri Lanka that all boast of beautiful nature and exciting wildlife. My guess is you couldn’t go wrong with any of them. But it was the elephants that really enticed me, so I decided on Udawalawe. Because of the draw of the Udawalawe reservoir, there are an estimated 250 elephants that permanently inhabit the park. Which means there’s a really, really good chance you’ll find some on your safari (or even just on the side of the road outside of the park). We ditched the crowd here and went off on our own, ultimately finding almost a dozen more elephants without anyone else around! On occasion during my safari, an elephant would plant itself on the side of the dirt road and a few safari jeeps would crowd around it to watch, but I was glad that my guide preferred a more private setting and would avoid other jeeps like the plague. Instead, he took us onto smaller dirt roads away from other safari group so that we could have a more intimate experience watching elephants. Even a bit “off the beaten path,” we saw a total of 12 elephants on this safari, including one adorable newborn calf! Asian elephants are smaller than African elephants, with smaller ears, and are actually black in color but look brownish-grey when covered in mud as a shield from the sun. 2) But don’t miss all the other amazing wildlife. It’s no surprise that the elephants were my favorite part of the Udawalawe safari. But there were also so many other beautiful animal we encountered along the way that deserve the spotlight too! We saw tons of giant water buffalo bathing in small marshes and lakes, sometime in small groups but often in gatherings of 10 or more. There were also the most graceful herds of Sri Lankan spotted axis deer that would silently drift through the forest looking utterly picturesque. Monkeys, wild boar, rabbits, and mongoose also inhabit Udawalawe, and there’s a good chance you’ll see some (if not all) of them on your safari. Water buffalo bathe in the marshes and lakes in Udawalawe to escape from the hot midday sun. And don’t miss the beautiful variety of birds swooping overhead and perched in the trees. Even if an afternoon of bird-watching isn’t your idea of fun, spotting them on safari is still really amazing, My favorites were the little green bee-eater, white sea eagle, and of course the vibrant peacocks and peahens that inhabit the area in huge numbers. I had no idea I could get so excited about birds, but I loved the ones in Udawalawe! This little green bee-eater was one of my favorite, and can best be seen with binoculars as it’s tiny, quick, and blends in with the trees. If you’re really lucky, you may also find wild cats like leopards or fishing cats, or palm civets (if you don’t know what these adorable creatures are, go Google them right now), or even a sloth bear. I really recommend bringing a good pair of travel size binoculars for your safari, so you don’t miss out on animals that are hiding, or the stunning details on birds or mammals far away. This pair is great, because it has excellent clarity while still being super compact and lightweight, and comes with a case and a feature to mount your iPhone to take photos! The peacocks and peahens on this safari made it feel entirely different from the safaris I’d been on in Africa. 3) Be mindful of conservation and wilderness ethics. Generally speaking, seeing animals in the wild, such as on safari, is the best way to do it. Many parks or self-proclaimed “orphanages” actually engage in abusive or non-rehabilitative practices condemned by conservationists, but still widely enjoyed by tourists. It’s usually pretty easy to identify these places through some Google research (for example, run a quick Google search on “Pinnawala ethics” and you’ll get tons of results detailing why this “elephant orphanage” is actually a terrible place to support ). However, even on safari, there can still be some destructive behaviors that some guides practice, such as driving off designated roads (which tourists like but actually contributes to deforestation). Be sure to go with a reputable safari company run by people who are not just good at business, but who also deeply care about the welfare of the animals and the park. Our guide, Subhash, pointed out some jeeps that were driving off of designated roads and explained how this destroyed parts of the forest, and made it clear that even if tourists wanted him to do this, he loved the animals and the park too much to oblige. I absolutely loved that. For Subhash, this isn’t just a job that pays the bills; this is his passion. Never get out of the jeep during the safari, not only for your own safety, but for the safety of animals nearby and to avoid causing damage to vegetation. Stay quiet during safari, which means no yelling to your friend about how cool this is no matter how excited you are. And avoid bringing any wrappings or rubbish with you, because it’s surprisingly easy for things to fall out of the jeep on those bumpy drives. Even if you take an evening safari, you won’t be able to see sunset from within Udawalawe National Park because the park closes at 6pm. However, just outside the park gates and down the road a bit, you can get a spectacular sunset view at the Udawalawe Reservoir. And the best part? For one grand safari finale, many of the elephants, deer, buffalo, and birds will all congregate at the lake for an evening drink or bath. Deer, water buffalo, and elephants all gather at the water at sunset to drink and bathe. What an incredible sight to see! It’s really an incredible experience to be able to watch all these magnificent animals all join together in one open location, with the fiery sunset reflecting off the water. If you do a morning safari, I still recommend you make the trip to come see sunset here! 5) Continue your safari at the Elephant Transit Home. There are far too many unethical elephant (and other wildlife) centers around the world, and especially in South Asia. Please avoid any facility that offers elephant-riding, as well as Pinnawala Elephant “Orphanage” in Sri Lanka. 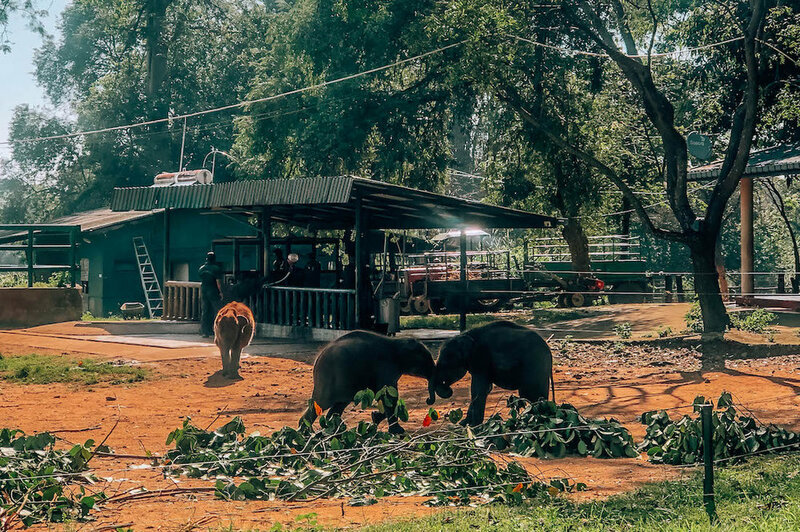 However, I was so glad to have discovered the Elephant Transit Home in Udawalawe, which has been recognized as one of the best wild animal rehabilitation centers in the world. The Elephant Transit Home cares for orphaned elephant calves with the main goal being to return them to the wild once healthy. Since the center’s inception in 1995, 250 elephants have found refuge and rehabilitation at the Elephant Transit Home and been released back into the wild at age five, when they are able to care for themselves. The baby elephants are fed milk at 9am, 12pm, 3pm, and 6pm, and visitors are allowed to watch the whole ordeal from a viewing platform. You get to watch little baby elephants run as fast as their marshmallow feet can take them to get bottle fed, throw baby-elephant tantrums by spraying milk on their caretakers, and playing/snuggling/wrestling with one another after their meal, some just learning how to use their trunks to crunch up leaves for food. If this doesn’t sound fun to you then I don’t know if we can be friends. It was so adorable to watch, and I had a smile plastered on my face the whole time. The ticket price for entry is 500 LKR for adults and 250 LKR for children (about 3 USD and 1.5 USD, respectively) and will only take about 30-45 minutes of your time. The Elephant Transit Home is about a 10-15 minute drive from the park entrance. Go on a weekday either in the morning or evening to avoid sitting outside in the midday heat for too long, and arrive early to get through the ticket line and find a good seat. You’ll be surrounded by locals and tourists, but it’s still a wonderful experience, and it’s so great knowing you’re contributing to an ethical conservation center and not supporting animal captivity. For tips on what time of year to visit Udawalawe, how to book a safari, what to bring, where to stay & eat, and more, read below! Udawalawe National Park is open year round, and whether you go in wet season or dry season, you can still have an amazing safari experience. The best time of year to see elephants and migratory birds is probably from October to April. But even on days with spurts of rain, there’s a good chance you’ll see elephants come out to dry themselves in the sun, and during or right after rainy season will offer the most colorful flowers and lush vegetation. You have the option of joining either a half-day morning or evening safari, or a full-day safari while at Udawalawe. The morning safaris begin around 6am, while the afternoon safaris will begin around 2:30pm (you can start earlier if you ask your tour company, but it might be a bit hot), and both last about 3-4 hours. Typically morning safaris will give you more time in the park, because you aren’t working against the clock for when the park closes at 6pm. However, afternoon safaris will generally allow you to see sunset from the Udawalawe Reservoir which is incredible. If you have the time and love safaris, I do recommend doing a full-day safari. I honestly could have driven around in that beautiful park all day long, searching for animals and soaking in the incredible views. Plus, it gives you more opportunity to see animals, because it’s impossible to predict whether they’ll be more active in the morning or evening each day. I had a great experience on my safari with Lakpura Travels and can’t recommend them enough. They were communicative and flexible, and my guide, Subhash, was extremely informative and eager to give us the most wonderful experience possible (while still prioritizing animal welfare above everything else). I also loved that he tried to keep us away from other safari jeeps so that we could have the most intimate and peaceful experience possible. From Colombo, Udawalawe is a 4-5 hour drive. Hiring a driver or taxi for the trip is the best way to get here. 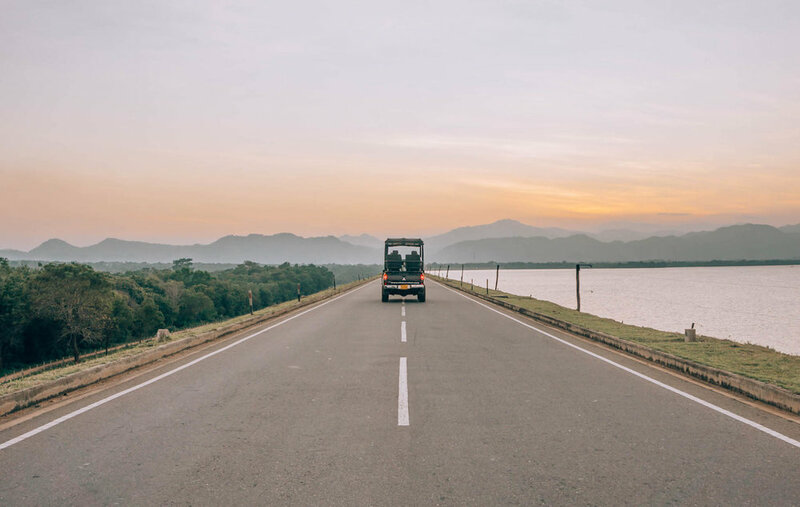 Many safari companies, including Lakpura, can help arrange transportation to Udawalawe from wherever you’re staying in Sri Lanka. 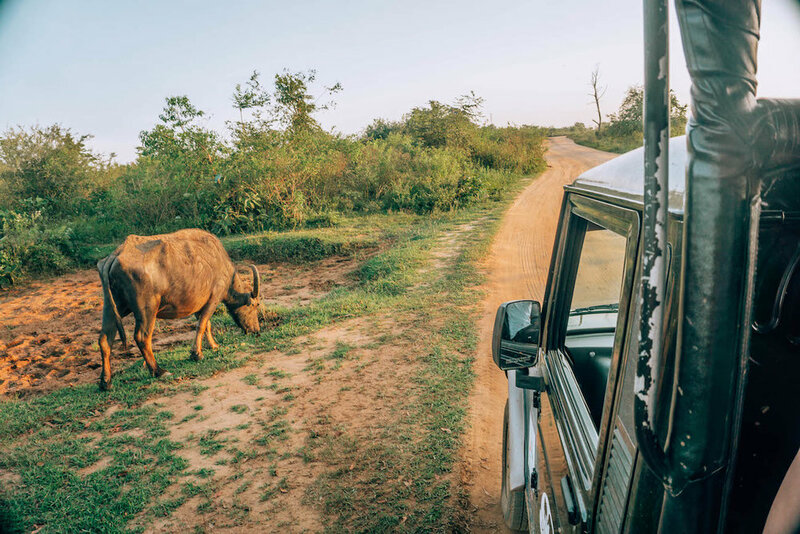 Once in Udawalawe, your safari company should be able to pick you up from your hotel, so long as it’s relatively close by. Lakpura picks up from any hotels within 5km of the park. The town of Udawalawe, outside the National Park grounds. I stayed at Udawalawe Nature House and can’t recommend it enough. The rooms were spacious, modern, and nicely decorated, with semi-private decks looking out onto the forest (request a forest view room to get this!). The breakfast and dinner was also really delicious and the hosts were so hospitable. This place is really great value for an affordable price, and close to the park! Most hotels in Udawalawe provide home cooked meals, and if you stay at Udawalawe Nature House you’ll have some delicious meals awaiting you. It’s often easier to eat at your hotel where the food is safer to eat, and you don’t have to try to wander around the area at night and risk coming across a wild animal. However, if you’re able to stop at Niwahana for a buffet lunch, do it. I can’t speak for the hotel itself, but I can say this meal was SO good, and super affordable. I hope this post has given you all the information you need to plan your safari trip to Udawalawe National Park! I seriously can’t recommend it enough, not only for the elephants, but also for the peaceful & stunning landscapes, the epic sunsets, and the local elephant conservation efforts. Have any questions about visiting Udawalawe National Park? Leave them in the comments below! This post was made in partnership with Lakpura Travels, and contains affiliate links. As always, I only provide my completely honest reviews, opinions, and recommendations..